Wednesday, September 12, 2018-Controversial businessman, Andrew Ngirichi, the husband of Kirinyaga Woman Rep, Purity Ngirichi, is one of the richest businessmen in Mt Kenya. Andrew throws money around like Githeri and he is never afraid to show off his lavish lifestyle. 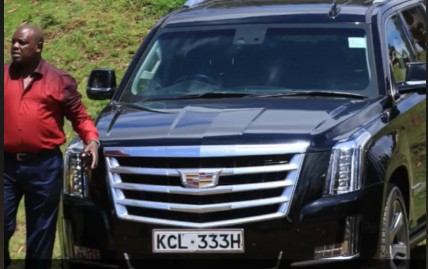 The controversial Kirinyaga businessman who has been linked to several illegal businesses including importation of poisonous sugar owns a fleet of high end cars that includes Maserati and Escalade. Most Kenyans see these guzzlers in Hollywood movies. Check out this video that shows Andrew Ngirichi’s flashy lifestyle.